The striking, contemporary design of this building helps it stand out in the centre of Limerick. The centre incorporates a church front and a full-height glass atrium façade, with a strategic address that leads on to the main street. This centre offers virtual office packages, as well as fully-furnished serviced offices, co-working space, and spacious meeting/event rooms. The Hunt Museum and the Limerick City Library are a short walk away, which are perfect destinations to explore outside of work. A selection of office spaces is available at flexible rental terms in the attractive business area of Limerick. Fully furnished to a high standard and equipped with state-of-the-art technology, they offer a highly professional environment provided with air-conditioning, high-speed internet connection and high quality administrative and maintenance services offered by an experienced support team. The offices are close to the city centre and well served by public transport links and by the major national roads. Pricing at this space is all inclusive, so you won't get any surprises at the end of the month! Offices come fully furnished and on flexible terms. 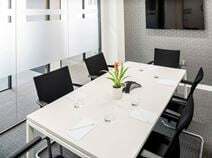 They are accessible 24/7 and come with on-site meeting rooms which can easily be reserved with the help of the on-site management team, which also assists with telephone answering, mail handling and greeting your clients. Limerick Railway Station is only seven-minutes walk away from the building, and you will find many local amenities within walking distance.